DHAKA, Bangladesh — Sri Lanka began the second test against Bangladesh with the upper hand, finishing the first day leading by 166 runs and having taken four of the host's wickets on Thursday. Sri Lanka decided to bat first and appeared to make a modest 222 in 66 overs. Opener Kusal Mendis top-scored with 68 off 98 balls. Then the total looked imposing after the Sri Lanka bowlers went to work and reduced Bangladesh to 56-4 at stumps. "For me, we were 30 runs short," Sri Lanka batting coach Thilan Samraweera said. "Normally, on a Dhaka wicket 240, 250 is a very good score. But at the end of the day we took four wickets, four top-order batters. "The game is still in the balance." Sri Lanka fast bowler Suranga Lakmal returned 2-15 and offspinner Dilruwan Perera 1-25 to bolster their side on a tricky pitch that offered turn and bounce. Lakmal struck with the third ball, dismissing Tamim Iqbal with a return catch. Mominul Haque, the first Bangladeshi to hit a century in both innings of the drawn first test, was run out for a duck. Lakmal bowled Mushfiqur Rahim, who offered no shot on 1, and Bangladesh was 12-3. Imrul Kayes' resistance was broken by Perera, who took him out leg before wicket on 19. Kayes, who appeared set to recover the innings beside Liton Das, reviewed in vain. Das was 24 not out, and Mehidy Hasan on 5. In the Sri Lanka innings, left-arm spinner Abdur Razzak, 4-63, and Taijul Islam, 4-83, starred. Fast bowler Mustafizur Rahman cleaned up the tail with 2-17. "(The pitch) wasn't unplayable," Razzak said. "This type of turn is evident in a lot of places. It wasn't stopping or keeping low. "It is a definitely result-oriented wicket, and the match, given its current state, may not go to the fifth day." Bangladesh was far from out of it, he added. "Every session has different characteristics. There's always room to recover in a test match," Razzak said. "We lost two wickets too many but I think we can recover from here." 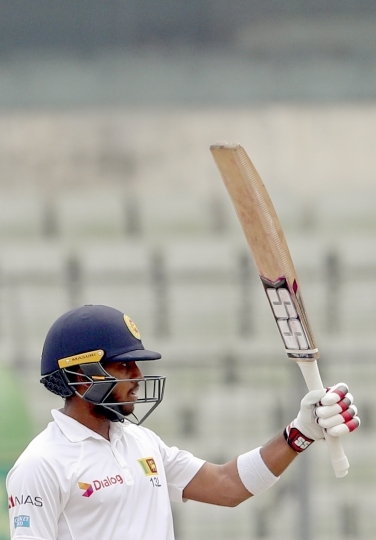 Mendis hit 10 boundaries and a six, and Roshen Silva made 56 at the end, but all around them their teammates were coming and going with regularity. Playing in his first test since 2014, Razzak removed opener Dimuth Karurantne, who was stumped on 3. Mendis and another first-test century-maker, Dhananjaya de Silva (19), combined for 47 when Islam got the latter caught at first slip. Razzak dismissed Danushka Gunathilaka (13) and Chandimal (0) with consecutive deliveries, and struck again in the first over after lunch, removing Mendis. Silva, with his third half-century in four innings, added 52 runs with Perera to stall the collapse, and 43 with Akila Dananjaya to move Sri Lanka past 200. By stumps, their 222 looked grand at Sher-e-Bangla National Stadium.